A couple of lunar hopefuls have launched an audacious Kickstarter tin-rattle aiming to raise £600,000 towards sending a spacecraft to the Moon. 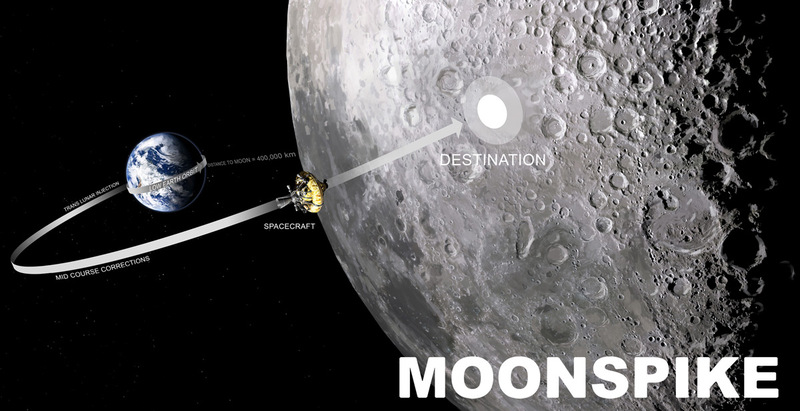 Once Moonspike arrives, it impacts with the lunar surface, driving its "lunar penetrator" spike packed with backers' digital data into our satellite. Chris, whose background is in the resolutely terrestrial tech business sector, had the idea for Moonspike after watching videos of the plethora of High-Altitude Ballooning (HAB) flights which have recently filled the skies. He explained to El Reg: "I've probably seen dozens if not hundreds of those over the past few years, to the point that I was wondering what else could we possibly do, and something in the back of my head said 'how hard can it possibly be to get to the Moon these days?'" Specifically, Chris pondered how hard could it be to get 1g on to the Moon, a question he put to Kristian, who'd recently departed Copenhagen Suborbitals. The answer is that while a tad tricky, it can of course be done, and after further discussion and a bit of seed cash from friends, Moonspike was born. Evidently, the project would be something more than an amateur effort. Kristian explained: "What we discussed immediately was that we had to take it to the next level, that we had to have a dedicated team that was hired to do this, not showing up doing random evenings, but really dedicated." Some initial work has produced the rocket's initial design, which incorporates some decidedly old-school tech. The first two stages will burn ethanol and liquid oxygen (LOX), harking back to Wernher von Braun's WWII-era V2 rocket, which was powered by LOX and an ethanol/water mix. Kristian noted: "We've been looking at a lot of different options on propellant, because there are pros and cons for all of them. For it is important, at least for this initial design, to have something we already know how to handle. We don't want to go down the hydrazine route, where everyone dies of poisoning, so there's an aspect of having stuff that's not too nasty." He said that while Moonspike's first two stages might end up powered by kerosene and LOX - currently the mix of choice for many vehicles including SpaceX's Falcon 9 – for the time being "we really like the old-school combination". Chris added: "I think the goals are hairy enough, without adding on all the technology risk, and I think that's why we've gone back to almost basic rocket school." Fair enough, although the Moonspike spacecraft itself will require a restartable engine for course adjustments and the like during its four-day journey from low Earth orbit to the Moon. The current plan is to deploy a motor combining hydrogen peroxide and RP-1 (Rocket Propellant-1, a highly-refined kerosene) in a hypergolic reaction, although that again is up for further consideration. Just where Moonspike eventually blasts off from is similarly fluid, and depends to a large extent on "legal issues", which the team see as potentially as big a challenge as the technical ones. Accordingly, the emphasis has been on "creating a rocket design which can be launched from pretty high or low latitudes, opening up as much of the globe as possible", as Kristian put it. Chris cited "a launch platform off the coast of Kenya run by the Italian space agency", a New Zealand launch site being opened by Rocket Lab, and "even Iceland". Wherever Moonspike finally slips the surly bonds of Earth, it's highly ambitious stuff, and begs the question, how much is it really going to cost? Chris admitted: "Tens of millions, that's the truth. I'm very realistic about these things and I understood immediately this wasn't going to be a cheap one-million-dollar project. "The money we're asking for from Kickstarter is just to get the first small team up and running for the first 12 to 14 months, and we're going to use that runway first of all to create some hardware to show to people, and also to go out for a more traditional investment phase." Kickstarter backers can choose from a range of rewards, ranging from mission patches to replica rocket motors to the chance to attend mission control on launch day. All those stumping cash "will have the opportunity to send their images, videos or data to the Moon in special radiation-shielded memory vault" inside the lunar penetrator. There are full details down at the tin-rattle. Kristian concluded by promising "complete transparency" as Moonspike moves forward. He said: "Not only do we see this as an engineering adventure, but for us it's very important to get the message out that anyone who finds this remotely interesting can follow the development process on a weekly basis." Chris added: "I said right at the start of this project, if we take other people's money to do this, it's probably OK if we fail, as long as we genuinely try to do it and show people that we're trying properly along the way and not just coming up with a lot of waffle."